When the Kona Community Hospital staff came together a few weeks ago to discuss giving opportunities during the holidays, employees expressed a strong interest in giving back to the West Hawaii community. They decided to collect donations for three local non-profit organizations – Hawaii Island Food Basket, Hawaii Island Humane Society and Toys for Tots. Since the initial discussion, the hospital has collected several truckloads of donations for the Food Basket, Humane Society and Toys for Tots. 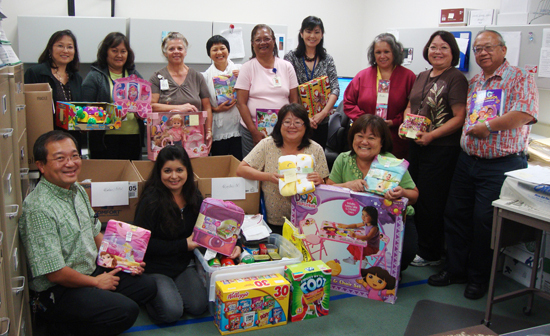 In addition, Family Support Hawaii asked the hospital to participate in their Kalikimaka No Na Keiki program. Their hope was to have the hospital sponsor at least two families. The two families skyrocketed to 26 families with a total of 39 children that were sponsored by the Admitting, Business Office, Contracts Management, Human Resources, Nursing Administration, OR, Pharmacy, Quality Assurance, Rehabilitation Services, Respiratory Therapy, and Risk Management departments, along with individual employees of the hospital. Personal contributions from the Kona Community Hospital Auxiliary volunteers were also generously made.